Chronic inflammation, synovial hyperplasia, and local hypoxia lead to synovial cell activation causing severe joint damage in chronic-inflammatory rheumatoid arthritis (RA). The proinflammatory and joint-destructive property of the increased release of extracellular nucleic acids has been demonstrated for extracellular mitochondrial DNA and oxidized DNA using an arthritis model. Microparticles derived from different cells are able to transport nucleic acids to distant cells and promote cellular activation in RA. In addition, extracellular RNA (eRNA) is present in the RA synovial lining layer, whereas eDNA could be detected in various areas of synovial tissue when compared to controls. The main source of eDNA is the formation of neutrophil extracellular traps (NETs) due to increased amounts of activated neutrophils in the synovial fluid in RA. 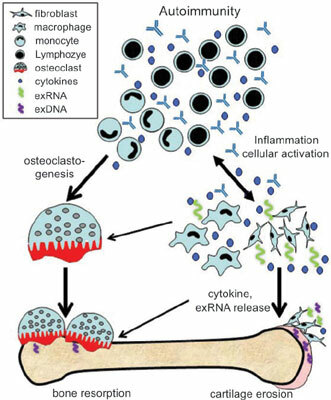 A central cell type of joint destruction is the activated RA synovial fibroblast (RASF) characterized by increased production of proinflammatory factors, matrix-degrading enzymes, enhanced matrix adhesion, and cell migration. eRNA was shown to be released by RASF under hypoxia and RNase activity was increased in RA synovial fluid. In vitro, RNase-mediated reduction of eRNA decreased RASF adhesion to cartilage but not proliferation or adhesion to endothelial cells. In vivo, RNase1 treatment reduced RASF invasion into cartilage. Therefore, extracellular nucleic acids induced by (auto)immune responses in RA appear to promote inflammation and local joint destruction. Extracellular RNA, extracellular DNA, toll-like receptors, rheumatoid arthritis, inflammation, autoimmunity, fibroblasts, cytokines.